Among Vail Resorts' upcoming capital improvements is upgrading the Northwoods lift (Chair 11) at Vail Mountain. The company talked about its second quarter fiscal earnings during a conference call Friday morning. VAIL — International visits to mountains owned by Vail Resorts in the United States are down 4 percent compared to last year, but the net income of the ski industry powerhouse’s resorts is $149 million, up 27.5 percent from last year’s numbers, in large part to the recently acquired Whistler Blackcomb resort in Canada. On Friday morning, Katz and Vail Resorts Chief Financial Officer Michael Barkin talked about the company’s second quarter fiscal earnings on a conference call. As a whole, Vail Resorts reported a strong second quarter, but without Whistler Blackcomb, a few categories are seeing declines compared to last year. Despite a slow start to the season in Colorado, local resorts are still keeping pace with last year’s second quarter. Vail continues to post solid numbers for the company, but the delayed Opening Day and the fact that two hotels have been closed for the majority of the season — Hotel Talisa and the former Holiday Inn — has had an impact. Katz said with the return of those hotels next season, Vail should turn around “quickly” in the lodging department. In Colorado, Katz said Keystone has been one of the strongest of company’s four resorts — Vail, Beaver Creek, Breckenridge and Keystone. Significant capital improvements are slated for Keystone, as well as other Vail Resorts mountains. Including results from Whistler Blackcomb in the second quarter, total lift revenue increased $70.6 million (24.5 percent) driven by a 15.7 percent growth in visitation and 7.7 percent increase in effective ticket price compared to the prior year. 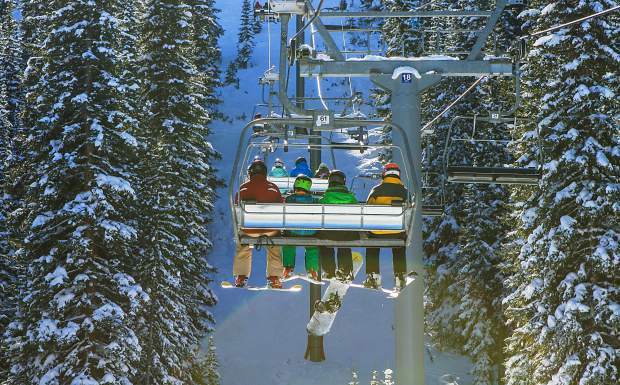 Excluding Whistler Blackcomb, total lift revenue for Vail Resorts increased 7.3 percent. Including Whistler Blackcomb again, Vail Resorts reported a second quarter increase of $16.1 million (25.9 percent) in ski school revenue and a 21.5 percent increase in food and beverage revenue compared to the prior year. Excluding Whistler Blackcomb, ski school revenue increased 1.3 percent. Dining revenue increased 21.5 percent for the second quarter compared to last season’s. Excluding Whistler Blackcomb, dining revenue decreased 2.5 percent as a result of the delays in the openings at certain resorts. Retail revenue increased 19.7 percent including Whistler Blackcomb. Excluding it, retail revenue decreased 2 percent. Inclement weather and poor early season conditions are attributed to the revenue decrease. In full, mountain reported EBIDA — earnings before interest, depreciation and amortization — increased $62.5 million, or a 26.4 percent increase compared to last year. Without Whistler Blackcomb, mountain reported EBIDA increased 6.6 percent. In the U.S., Park City, Utah, is proving to be a solid acquisition for Vail Resorts, which purchased the Utah resort in 2014. “Park City continues to deliver the strongest growth among our U.S. resorts with increasing visitation and yields in our second season following the transformational investments to combine Park City and Canyons,” Katz said. “Our Colorado resorts delivered results that were in line with their record prior year performance despite the slower start to the season. Vail Resorts has benefited from its geographic diversification of mountain resorts and the marketing of its Epic Pass, providing skiers and snowboarders a large mix of resorts where their passes will work. Adding Whistler Blackcomb to the Epic Pass list isn’t showing its full impact, yet. Vail Resorts added five days on Epic Passes to the recently acquired Canadian resort, purchased for $1.1 billion. Epic Pass products will be fully honored at Whistler Blackcomb beginning with the 2017 — 2018 ski season. With the Canadian dollar now in play for international visitors, Vail Resorts is expanding its reach to people who don’t want to come into the United States, for whatever reason. Vail Resorts owns four Colorado resorts; three California resorts; one Minnesota resort; one Michigan resort; two Utah resorts; one Wisconsin resort; one Vermont resort; one Australian resort; and with the purchase of Whistler, one Canadian resort. The Epic Pass debuted during the 2008-09 season with five resorts on it, costing $579. The Epic Pass for the 2017-18 season costs $859 and provides unlimited access to 14 resorts and includes some access to 30 European resorts across Austria, France, Italy and Switzerland. Katz credited the Epic Pass for maintaining strong financial numbers despite a weak start to the season. A large part of that was also credited to Whistler Blackcomb, voted No. 1 by Ski Magazine for Best in the West. With the $50 million agreement to purchase Stowe Mountain Resort in Vermont on Feb. 21, Vail Resorts is expecting the acquisition to close in the spring. Katz called Stowe a “unique opportunity” due to the power of its brand. Katz said the company will continue to look into affordable housing across its resorts as part of a $30 million commitment from last year. Vail Resorts expects to invest about $103 million in its 2017 capital plan, excluding anticipated investments at Whistler Blackcomb, capital expenditures for summer activities and a number of discretionary investments. • Vail: Upgrading Northwoods (Chair 11) to high-speed six-person chair. • Breckenridge: Upgrading Peak 10 Falcon Chair to high speed six-person chair. • Keystone: Upgrading Montezuma chair to high speed six-person chair; renovating and expanding Labonte’s restaurant by 150 indoor seats. • Beaver Creek: Upgrading Drink of Water (Chair 5) to a high speed four-person chair. Upon completion, all primary lifts on Beaver Creek will be high speed. • At Whistler Blackcomb, the company is planning to invest about $17 million for maintenance and other projects. Vail Resorts is also moving into the second phase of a two-year process to revamp its primary websites to a desktop and mobile platform. The project is part of a three-year plan to modernize the primary software platform for all of the resort operations.